Mâche, feminine noun (la mâche, de la mâche, but one doesn’t say une mâche or des mâches) = lamb’s lettuce. Not to be confused with the verb mâcher = to chew (je mâche, tu mâches, il/elle mâche, nous mâchons, vous mâchez, ils/elles mâchent)(= I chew, you chew, he/she chews, we chew, you chew, they chew). Do you remember the lost ‘s’ denoted by the circumflex accent (^)? 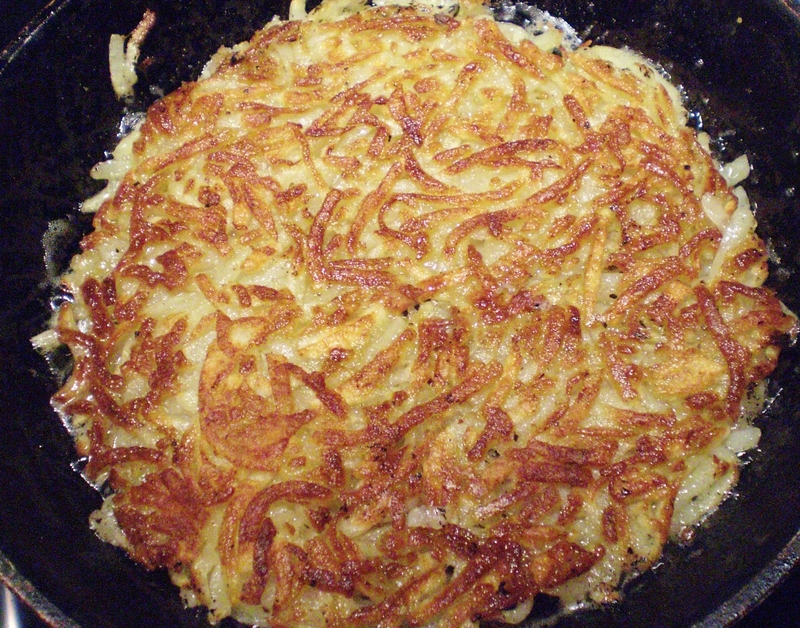 This comes from masticate, (mastiquer en français). Il ne mâche pas ses mots = he doesn’t mince his words, he’s not afraid of plain speaking. Lamb’s lettuce is not as frequently used as other salads, but it is becoming more “fashionable”, especially since it is now presented ready washed in packets. That’s the problem with lamb’s lettuce, it’s tricky to wash, because it grows on sandy soil which get stuck between the lower leaves. But it is worth the trouble, its emerald green adds sparkle to any dish, and it has a pleasant chewy texture and fresh flavour. I bought my mâche fresh this morning from a local farmer. 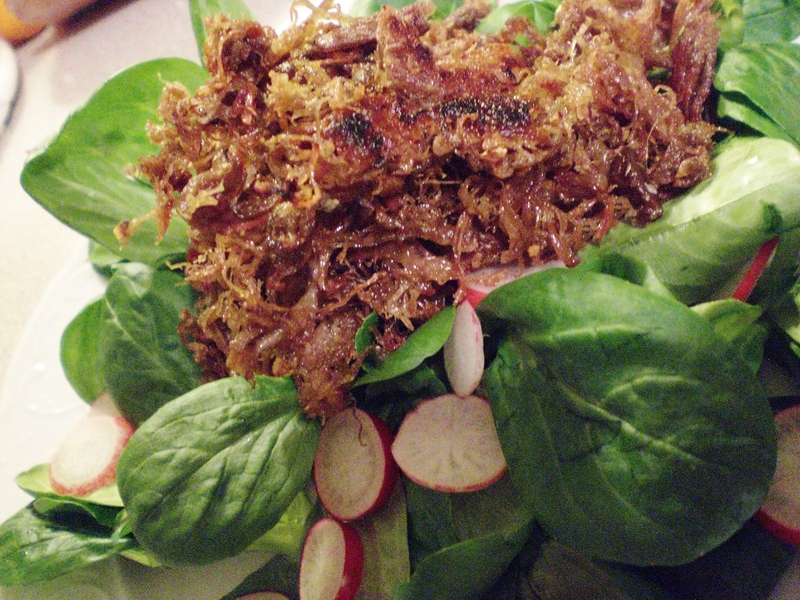 My recipe today is for a croustillant de canard sur lit de mâche (crispy duck on a bed of lamb’s lettuce). Let me explain. 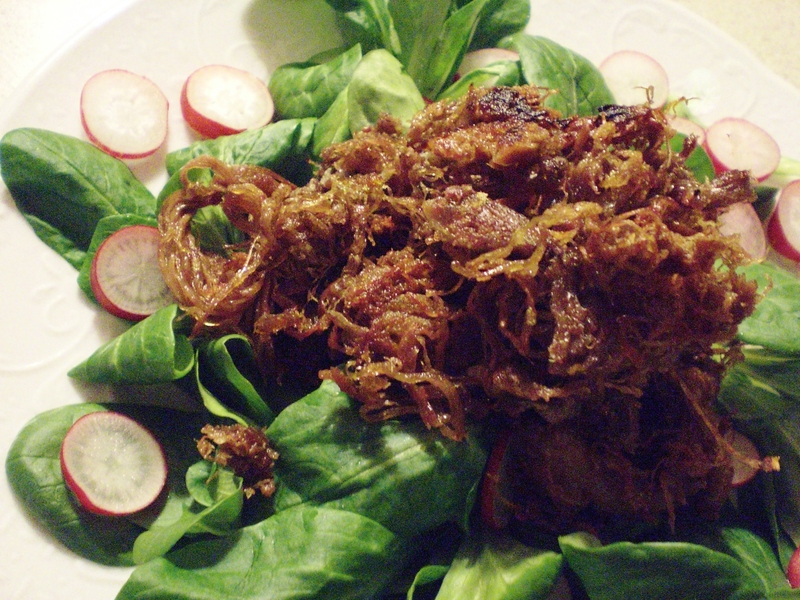 It consists of a cuisse de canard confit (a duck leg and thigh preserved in duck fat), and radishes and lamb’s lettuce. I think in our family it was my brother who first cooked a cuisse de canard confit crispy this way, my son also does a great version, but some people, in the south west of France particularly, thought it pretty heretical. I find it less rich and definitely economical, as one duck leg and thigh will do two people. Wash the lamb’s lettuce in a basin of water, swishing it around so that any sand falls to the bottom. Repeat several times with fresh water. Dry delicately in a tea towel. Nip off the root end but try to keep the rosette whole, it looks better. Clean and trim the radishes. Dry. 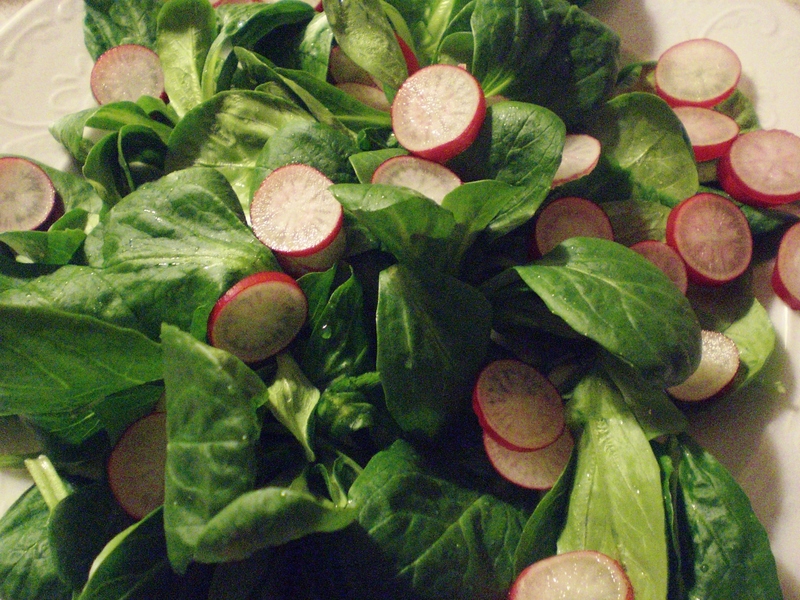 Arrange the lamb’s lettuce on two plates, slice the radishes. 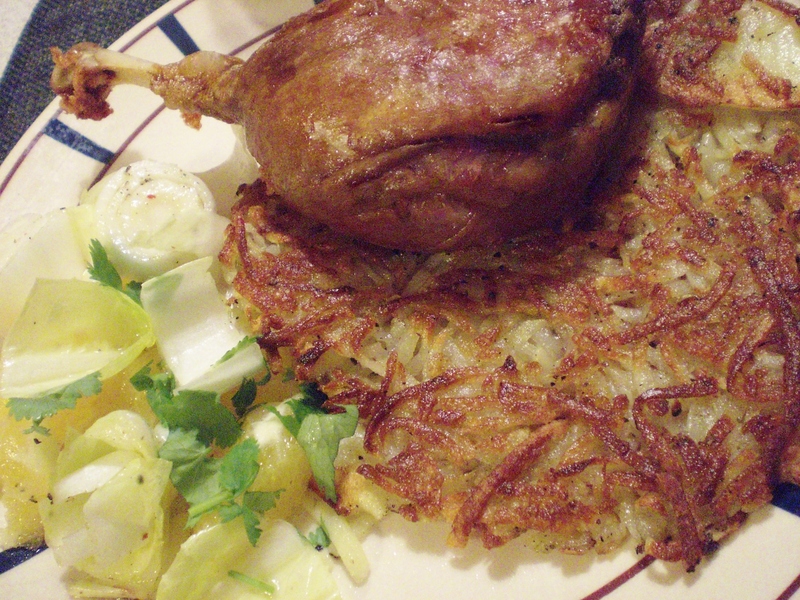 Unless you make your own, duck legs are sold in tins surrounded with duck fat. Remove the duck leg leaving a little fat around it. Place it in a heavy frying pan, one which is not going to be damaged by the shredding process, warm it up, and with two forks, remove the meat from the bone; discard the bone, but keep the skin. While continuing to heat the meat, separate it with the two forks until it is completely shredded. 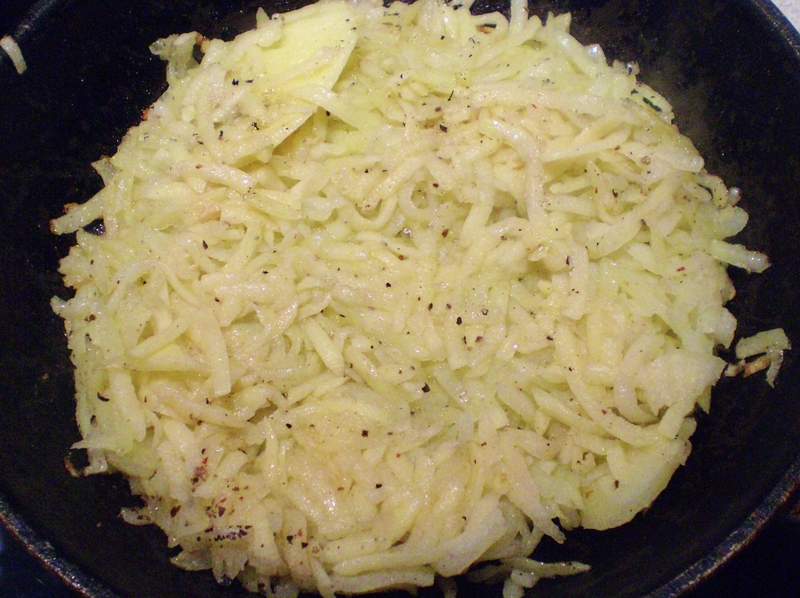 Gradually pour off the duck fat (into a pot which you will keep for frying vegetables). Keep stirring and shredding the meat, turning it frequently so that it crisps on all sides. And continue pouring off any excess fat. When the duck is golden and completely crispy, divide it in two and arrange a little pyramid in the middle of each plate. Sprinkle half a tsp raspberry vinegar over the salad (not over the duck), and add several grinds of black pepper and some fleur de sel or salt flakes. 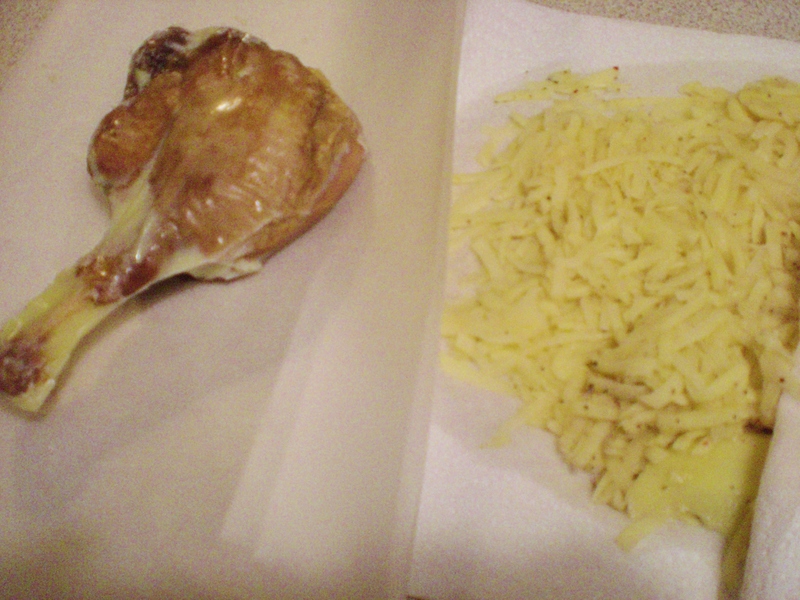 This dish is not as fatty and rich as plain confit, because the grease has been progressively poured off. And the thick salad leaves offset the duck perfectly. Posted in Feminine Nouns, French recipes, fry, Main courses, Nouns, Salads and tagged canard confit, Cook, Duck, France, French food, French pronunciation, French recipes, French words, lamb's lettuce, mâche, Recipe, salad. Bookmark the permalink. Ananas, masculine noun (l’ananas, un ananas, des ananas) = pineapple (pronounced a-na-nasse, you say the s for once!, but only in the singular. Then again, in certain regions, they don’t say the s. In the plural, you don’t hear the s any longer anywhere). Pronunciation: a word about “liaison”: la liaison is when you run one word into another, as here, un ananas, you join the n of un to the a of ananas, and the s of des into the a of ananas in the plural. The rule is roughly that when a noun begins with a vowel, you run the consonant into the vowel. For example: deux beaux ananas, two lovely pineapples, you run the x of beaux into the a of ananas, to make deu bozanana. 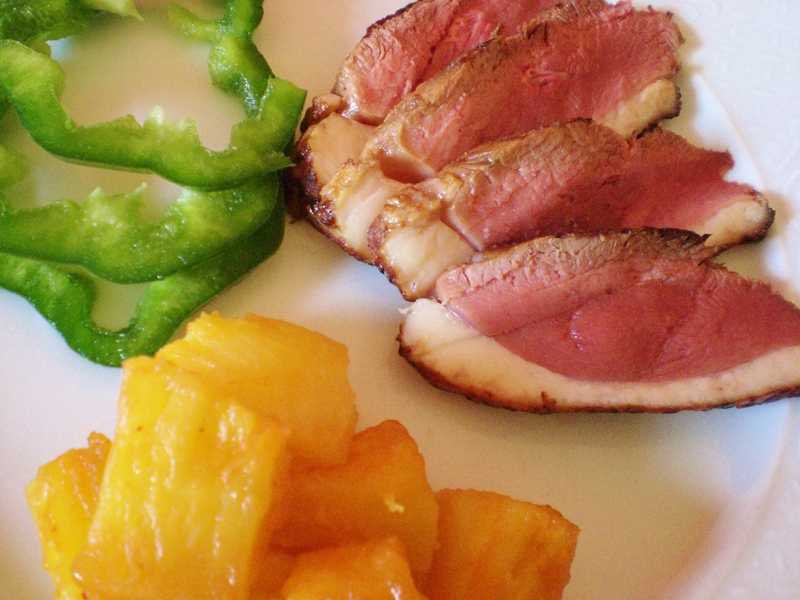 My recipe for today is magret de canard froid à l’ananas confit (cold duck breast with caramelized pineapple). Very often, a duck breast (magret) is so enormous, that it is too much for one meal. You can eat one half hot, and the other cold. But you can also cook duck breast ahead of time, chill it in the fridge, and slice it for a cold meal, picnic or lunchbox. To use cold, duck really needs to be nice and pink inside, or it will just be dull and dry. Do not score the duck breasts for this recipe, so that you can make neat slices across the width when it is cold. 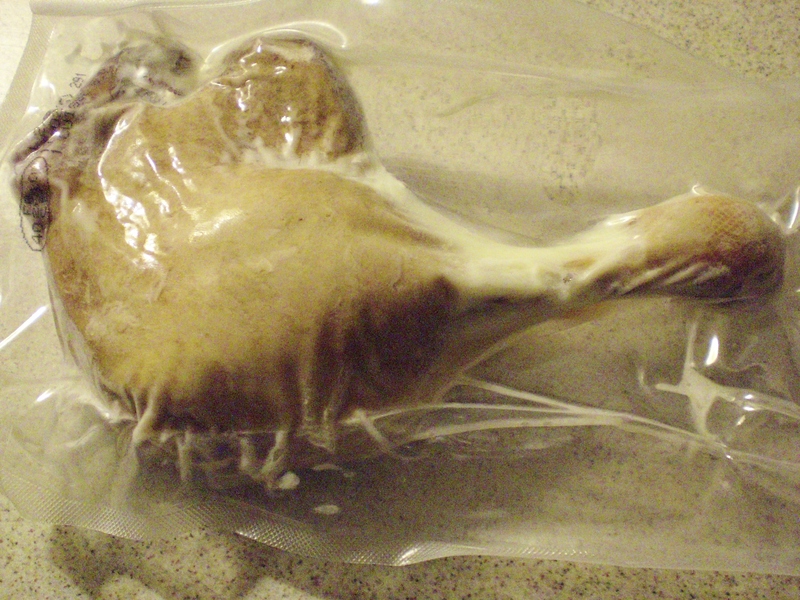 Pat the duck breasts with kitchen paper to remove all moisture. Season on both sides with salt and freshly ground black pepper. Heat a heavy bottomed frying pan so that it is really quite hot and put the duck breasts to cook, skin side down to begin with. Fry for about 4 minutes, pressing down with a spatula to make sure all the surface of the skin is in contact with the pan. Pour off the excess duck fat as it melts. When the skin is nice and crispy and the layer of fat under the skin has melted to a certain extent, turn and cook the other side for about 3 or 4 minutes depending on the thickness of the duck breast. Remove from the pan and place on a plate to cool before putting in the fridge. Peel, slice and core a fresh pineapple, cut into generous chunks and keep all the juice that runs off. In a non stick frying pan, melt some butter, and fry the pineapple gently. Add 1tbs acacia (or other runny) honey and a tbs of your preferred vinegar (but not balsamic which will discolour the pineapple and make it look unappetizing). Salt lightly, and add any pineapple juice and half a glass of white wine. Cook quite briskly until the pineapple is tender and the liquid has boiled down to a coating syrup. Remove from the pan into a bowl, cool and refrigerate. To serve, place the duck breast flat on a chopping board, skin side up. With a very sharp knife, cut slices on the diagonal (as in the picture above) about 1/4 inch thick. Overlap half a dozen slices on each plate. Toss the pineapple in the juices to glaze. Place a heaped spoonful or two, without juice, next to the duck breast. Slice two green peppers, and garnish the plates with pepper slices. This is a really delicious and attractive cold meal, and is easy to eat out of a lunch box or on a picnic, no sauces to drip, no difficult-to-pick-up pieces. Posted in French recipes, Main courses, Masculine Nouns, Nouns, Snacks and picnics and tagged Ananas, Canard, Cook, Duck, France, French food, French phrases, French pronunciation, French recipes, French words, Pineapple. Bookmark the permalink. Magret = duck breast (pronounced ma (like mama) – grey) is a masculine noun: le magret (= the duck breast), un magret (= a duck breast). In fact, magret just means breast (of a fowl), but since other birds are rarely used, it is usually taken to mean duck breast. 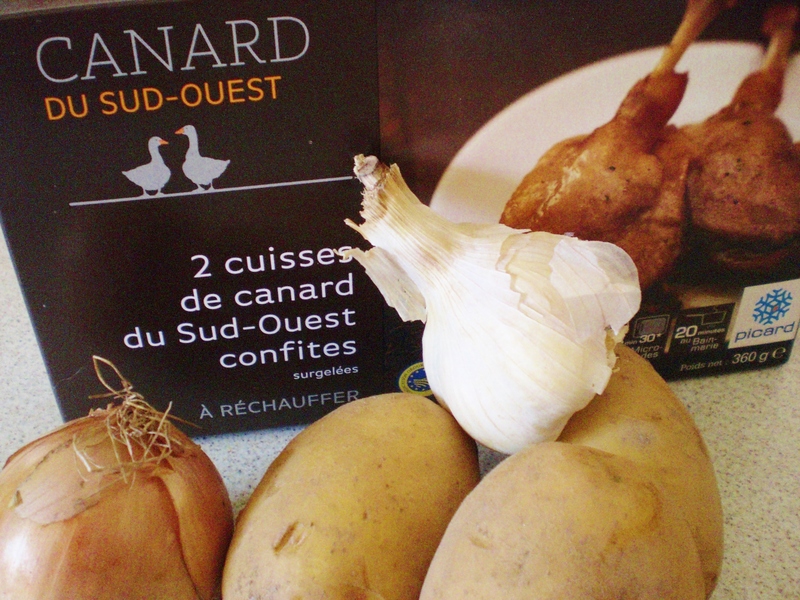 The full translation of duck breast is magret de canard, canard meaning duck. The word magret does not apply to a chicken breast. The word for that is blanc, blanc de poulet, blanc meaning “white”, the white meat. 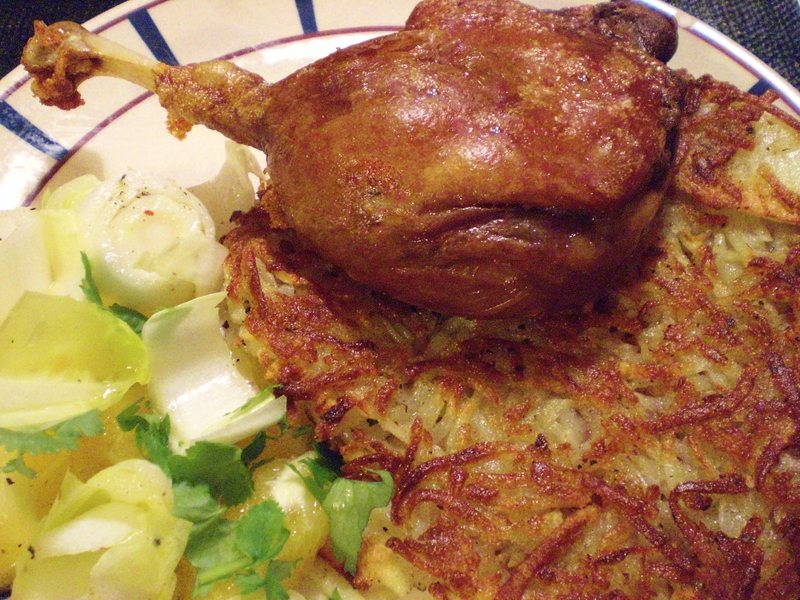 Magret comes from the word maigre meaning “lean”, as it is the leanest meat on a duck. Wipe the duck breast with paper towel until nice and dry. Prick the fat side of the breast with a skewer or fork. This will help the fat to escape and make the skin crispier. With a sharp knife, score the fat in one direction and then the other to make diamond shapes. Do not score the meat under the fat. Place in an oven dish skin side up, rub with salt, grind pepper over the breast, drizzle the soy, grate the orange rind over the scored side, pour the orange juice over and let it run into the dish, and spread the honey evenly. Place in the hot oven for 20 minutes or until the skin is really crisp. The meat should remain pink. Duck is not nice when it is overcooked. This cooking time depends entirely on the thickness of your duck breast. 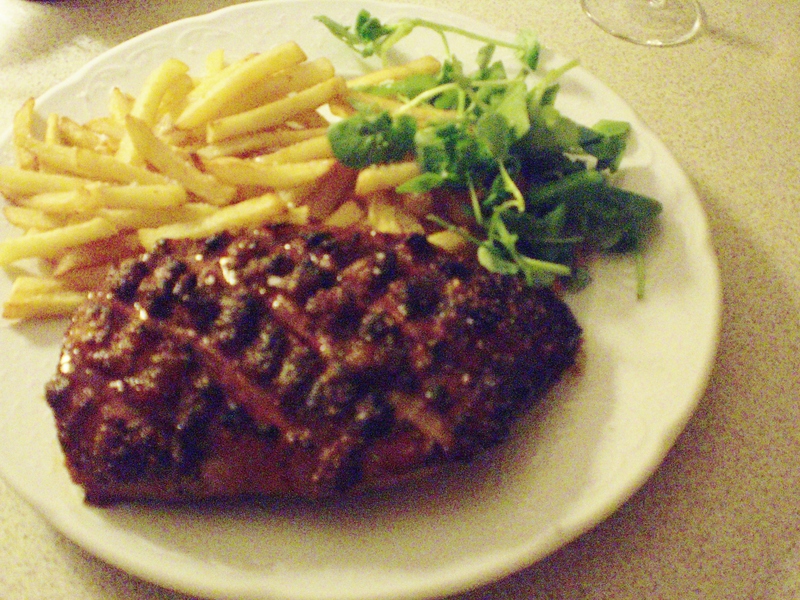 Serve either whole or cut into diagonal quarter inch slices, accompanied with chips (french fries) and a green salad. The magret in my picture may look a little singed, in fact it is just deliciously caramelized. This, with a dozen oysters, was my New Year’s Eve dinner this year. If you eat magret in a French restaurant, the waiter will ask you: “Et la cuisson?” (and how would you like it cooked? ),or words to that effect, to which you may answer either “bien cuit” (well cooked, at which he will certainly frown), “à point” (fairly well cooked) , “rosé” (just pink, which is personally how I prefer it), or “saignant” (literally “bloody”, or not very cooked at all). Have your answer ready in advance, don’t get caught out! These adjectives also apply to beef (steak) and lamb. Posted in French recipes, Main courses, Masculine Nouns, Nouns and tagged Canard, Cook, Duck, France, French food, French fries, French language, French phrases, French pronunciation, French recipes, French vocabulary, French words, magret, spelling and vocabulary. Bookmark the permalink.